While Steph’s permeability measurements (see the post from July 23) served as our chief scientific focus on the ice given their direct relevance to her dissertation work, they were far from the only in-situ data we collected. We measured many standard physical properties (stratigraphy, density, temperature, etc.) 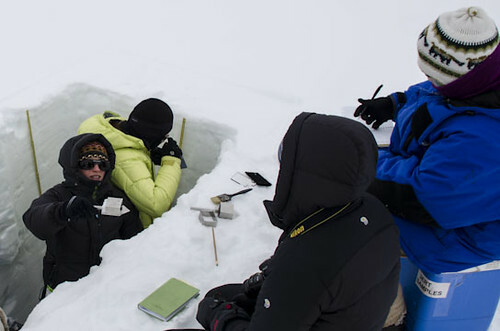 in the 1.4-meter deep snow pit to gain both practice with field instruments and familiarity with snow properties. In addition, I elected to take hourly temperature measurements to complement data I am analyzing in my current project. Ali and Jess looking at layers of “hoar,” comprised of very coarse and porous grains. We looked at the snow from top to bottom, observing changes in its appearance and labeling it on a spectrum from coarse to fine. Steph has experience characterizing snow coarseness from the Antarctic firn cores she analyzes and shared her knowledge with the group. Lee also conducted a “hardness test” by looking at the relative depths to which she could push a pencil into the snow with the same force. 2) Density: We measured the density of the snow continuously from the surface to the base of the snow pit with a small, sharp metal tool. We generally expect density to increase with depth (as more and more snow builds up, the underlying snow compacts), but the density values and amount of change vary between sites and times of year. 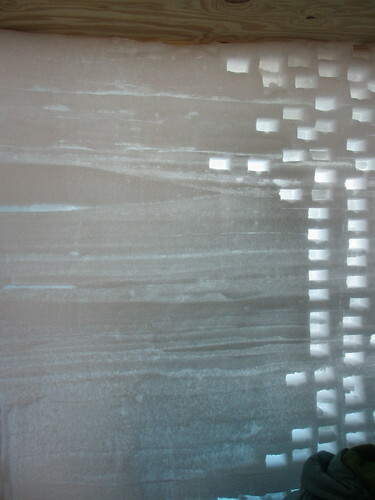 The metal tool cuts into the snow, leaving a 3-cm high rectangle in the pit wall. We measured the weight of the extracted snow on a balance and divided that by the known volume of the tool to give density. Chelsea handing Lee the density cutter filled with snow, ready for weighing. The pit wall with holes left from density measurements. 3) Temperature: Nine thermometers placed in the pit wall provided a temperature profile with depth. I elected to take regular readings of near-surface snow temperatures in the hope that they could elucidate the source of some variability in Summit temperature data I’ve been analyzing back in Hanover. Additionally, I was interested in seeing how deeply the daily fluctuations in temperature are “felt” in the snowpack. 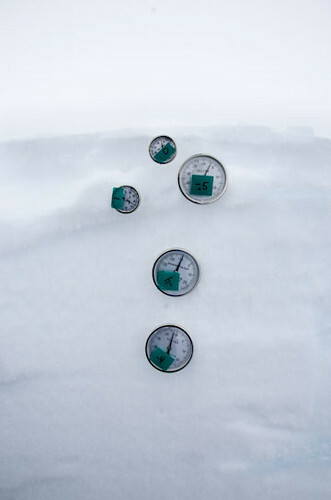 The top five thermometers, spaced at 2, 4.5, 7, 13, and 20 cm from the surface. Our scientific experiences in the field were complemented by talks that we’d prepared for each other (Mary gave a talk on firn which virtually the entire camp attended!) and interactions with other scientists on base. One in particular, Kevin Hammonds, is a grad student at the University of Utah and gave us a tour of the “Mobile Science Facility” (MSF) of the Integrated Characterization of Energy, Clouds, Atmospheric state, and Precipitation at Summit (ICECAPS) project for which he is a summer technician. He showed us the myriad of radar, LiDAR, and microwave instruments and cameras designed for looking at the microstructure of clouds and snowflakes. Check out the cool pictures from his blog! 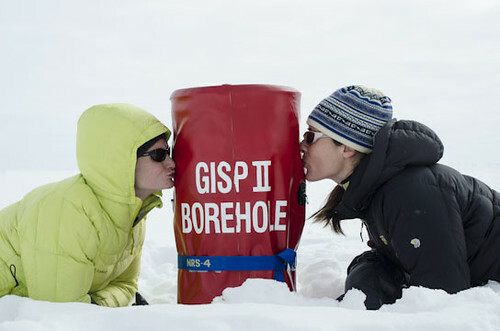 The ice core from the Greenland Icesheet Project (GISP2) reaches two miles down to the base of the ice. It archives over 100,000 years of Earth’s history and has provided much of what we know about climate change today. 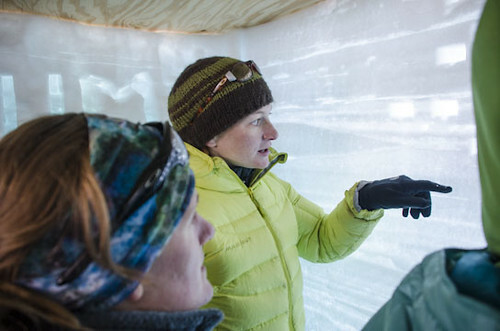 Summit provided an ideal classroom for sharing glaciological knowledge; I think we were all bummed that our time there was so short! 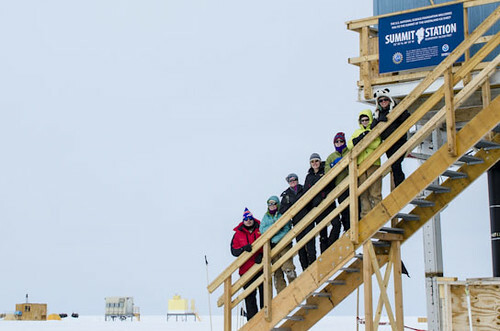 The group on the stairs of the “Big House” at Summit Station.